A small coalition of community organizations rallied at LA Unified headquarters today, urging district leaders to invest in more restorative justice programs and alternative schools. The Dignity in Schools Campaign joined with leaders of the parent group, CADRE, Public Counsel and the teachers union, UTLA, to celebrate, what they called “a minor victory.” Beginning next year, the district will stop spending $13 million in state money allocated for the neediest students on school police programs. But, while some of that funding will now be directed toward the intended population — English learners, special education, and low income students — social justice advocates say it’s not enough. The district’s 2015-16 budget of nearly $7.1 billion includes an additional $2 million to support restorative justice programs, which officials have said will boost the ranks of counselors throughout the district, and another $1 million for continuation schools. 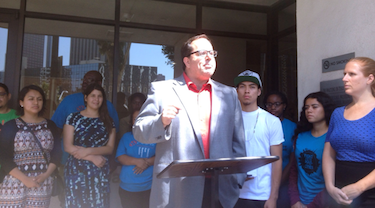 Alex Caputo-Pearl, president of UTLA, said siphoning funds from poor students to pay for policing is a form of racism. “When south LA and other parts of Los Angeles sometimes resemble prisons, sometimes resemble a police state, more than they look like an educational setting, that is a problem, and it is often a reflection of institutional racism,” he told a small crowd gathered on a sidewalk. Caputo-Pearl says UTLA intends to take a greater role in setting the goals and priorities for the district’s Local Control Accountability Plan, which the school board is also expected to pass today. Under Governor Jerry Brown’s new school funding formula, districts are required to solicit input from parents, teachers and students on how a district will spend state funding. They are also mandated to include measurable benchmarks. “We are going to put a renewed emphasis on actually working with community organizations and parents in defining what the needs of schools are, which LAUSD has been pretty short shrift on,” he said.